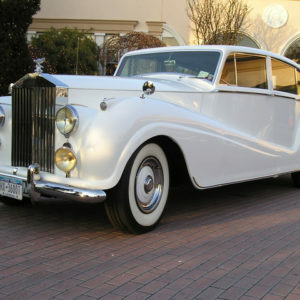 Categories: Promotions, Romantic Wedding Proposal Ideas, Vintage & Classic Collection, Weddings & Special Events. 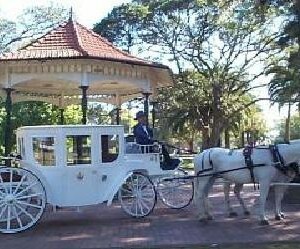 Tags: horse drawn carriages sydney, open top wedding carriage sydney, wedding carriages, wedding carriages sydney, wedding glass carriage sydney, wedding horse and carriage sydney. 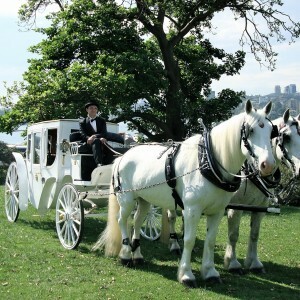 If you want to feel like a princess on your wedding day then travelling by horse and carriage is the way to arrive. 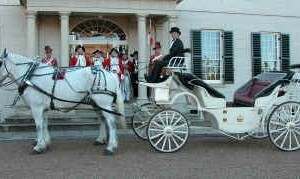 Maybe you see yourself in a glass wedding carriage or perhaps an open top horse drawn carriage is more your style ( can be covered when required ). Both styles will add a most romantic touch to your wedding day and provide stunning wedding photos. Note: The horses can travel up to 5 kms, ( we need to treat these beautiful animals with kindness). Is your home – church – reception greater than 5 kms. ? 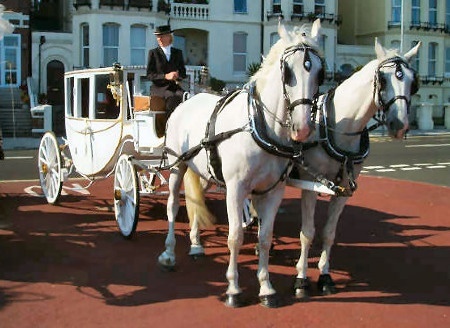 No problem – you can still arrive at , and depart from the church in your wedding horse and carriage. We simply meet you a short distance from the church. What other couples have done..
With the open carriage, the hood is kept up as the bride travels to the church and is dropped down just around the corner from the ceremony. After the ceremony, the hood is kept down till the couple ride around the corner. Keeps the hair and gown looking fabulous for photos and the celebration afterwards. 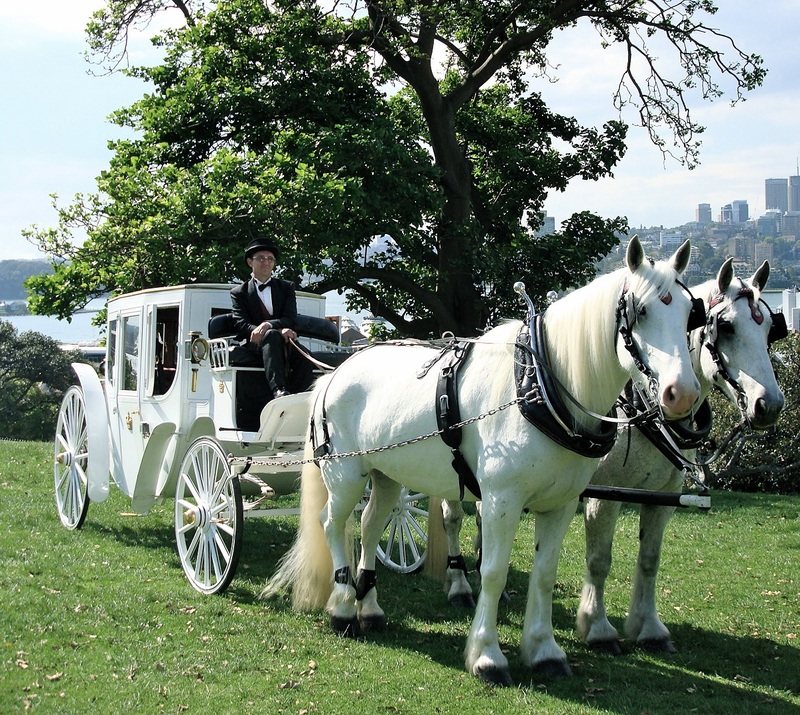 When the wedding or photo location is outside of the 5 km radius that the horses can travel, then we load the carriage and horses in a trailer and bring them to your preferred location. Just allow time for this. There is no additional charge for this service, unless there is more than 1 destination. 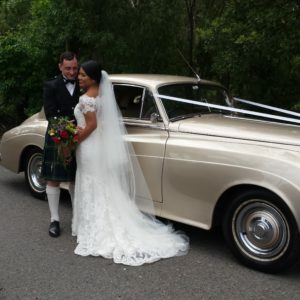 Wedding outside of Sydney area ? Perhaps in the Southern Highlands, Bowral , Central Coast or Goulburn ? 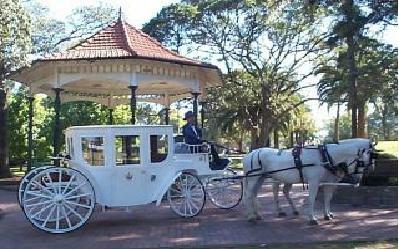 No problem !The wedding horse and carriage will happily attend your wedding. Nominal additional charge to travel to these areas may apply. A popular idea which will add to your wedding memories is to have the horse and carriage turn up after the ceremony -just for photos. We love to travel. 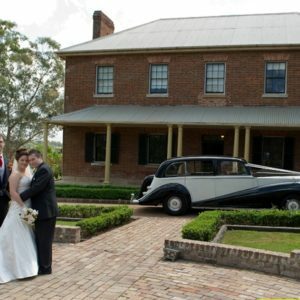 Email us for a tailored quote if your wedding is outside the above out of Sydney destinations. Marian and I would like to thank you for all your effort yesterday. We really enjoyed the horse and carriage, it was beautiful. I booked these guys for my wedding in June and they were amazing! Unfortunately, there aren’t any of these beautiful carriages where I live but I managed to find these awesome people who were willing to commute for a reasonable price. Our driver could not have been better; he was so friendly and knowledgeable. During our ride, he spotted a good photo location and got so excited! Everyone has commented on how beautiful the horses were and as my maid of honour and I were turning up to my wedding, we were actually commenting on how well-trained they were. Thank you for being exactly what I wanted!